Greg McLaughlin is moving from president of the PGA Tour Champions to leading three noncompetitive operations at the PGA Tour, including oversight of the World Golf Hall of Fame. The appointment announced Wednesday gives McLaughlin a sprawling role previously held by three people. “I’m not sure we could have asked for a more qualified, passionate leader, considering his deep level of experience and executive leadership success within the golf world and beyond,” PGA Tour commissioner Jay Monahan said. McLaughlin just completed his fourth year running the PGA Tour Champions, which included a Charles Schwab Cup playoff system similar to the PGA Tour. Before joining the tour, McLaughlin had spent 14 years as chief executive of the Tiger Woods Foundation. McLaughlin will be chief executive of the World Golf Foundation, which represents all the major golf organizations in supporting various programs geared around growth and providing access to the game worldwide. He replaces Steve Mona, who will help McLaughlin with the transition before retiring next year. McLaughlin also becomes president of The First Tee, a program launched in 1996 that introduces golf’s core value to young people. Keith Dawkins had been the chief executive until leaving in October after one year. “This restructure represents an exciting evolution for the World Golf Foundation, and Greg is the perfect person to take the mantle,” Monahan said. Most vague about the changes was McLaughlin’s involvement in the World Golf Hall of Fame. The tour said Jack Peter, president of the Hall of Fame, would retire at the end of the year. It said McLaughlin would “strategically direct” the Hall of Fame, which has struggled to attract visitors in its 20 years in St. Augustine, Florida. It also has moved its induction ceremony, now every two years, to the same week as major championships to attract more attention and more players. It was in St. Andrews in 2015 during the British Open, New York in 2017 during the Presidents Cup and next summer at Pebble Beach as part of U.S. Open week. Brodie Waters, the vice president of business affairs at the Hall of Fame, will lead the structure, funding and operations with McLaughlin’s oversight. McLaughlin previously served as tournament director at the Los Angeles Open and offered Woods his first sponsor exemption on the PGA Tour. He also was tournament director at the Honda Classic and the Western Open before joining the Tiger Woods Foundation. 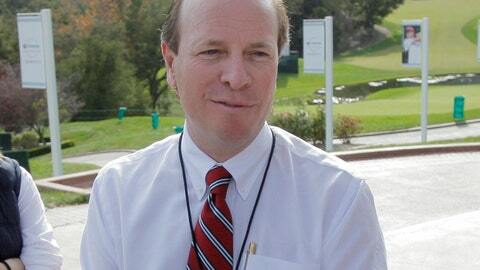 Miller Brady, a 19-year employee of the tour, succeeds McLaughlin as president of the PGA Tour. He worked under McLaughlin as chief of operations for that tour.